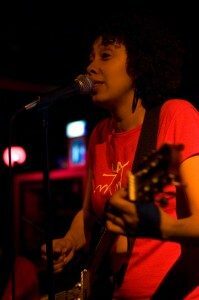 Emerging Brazilian singer/songwriter Luanda Jones has been captivating audiences for over a decade with her unique blend of suave, jazz inflected vocals and stylized guitar harmonies, passionately interpreting some of the South American nation’s most cherished popular musical traditions. Drawing from the effervescent wellspring of Brazil’s diverse MPB (Brazilian Pop Music ) genre, Luanda colours the expansive, encyclopedic sonic shades of her cherished influences with an unforgettable vocal charm and entirely welcoming onstage personality. Originally from Rio de Janeiro, Brazil, and born into a musical family, Luanda’s ear was keenly tweaked from an early age. Her father, Luis Moreno, was a veteran rock drummer who played with some of the biggest names in MPB, including the eternal Elis Regina, rocker Raul Seixas, Luis Melodia, Zezé Motta, and the progressive rock group O Terço. Mother Irinéa Maria Ribeiro, for her part, has worked as a recognized songwriter and arranger for over 30 years, writing with such celebrated names as Tim Maia, Jane Duboc, and Cauby Peixoto, among others. With those two parental forces, it’s little wonder that from her earliest performances at the tender age of nine, the young singer knew that she had found her calling. The invaluable influences of her early home life would swell dramatically over the years to include not only Brazilian stalwarts such as Tom Jobim, Jorge Benjor, Gilberto Gil, and Rita Lee, but also international artists like the Beatles and Badi Assad. Luanda has also received classical vocal training from the esteemed Professor Vera Canto e Mello, earning her a graduate certificate in music harmony studies from the MusiCenter music school in Rio de Janeiro. Building on those initial studies, Luanda would soon earn the respect and affection of many established songwriters, among them Zélia Duncan, Paulinho Moska, and Luiz Melodia. As her own skills and reputation as a songwriter grew, Luanda would receive calls to perform in respected music houses and in many of the coveted competitive music festivals throughout Brazil, from São Paulo to Bahia, and back down to the southern state of Rio Grande do Sul. Each of the above artists and their peers have played an integral part in Luanda’s continued quest for sonic expansion, a search that has most recently brought her to Toronto, Canada. Despite the difficult decision to throw herself into the unknown artistic reality of a completely foreign land, Luanda has battled through the initial struggles and is quickly making a name for herself in the Toronto music scene. A staple at the city’s Lula Lounge, she has opened for a host of both local and international artists, including Brazilian singer and virtuoso guitarist Badi Assad, Carmen Souza, Lady Son, and LAL. Luanda has also performed with the Toronto-based Brazilian percussion troupe Maracatu Nunca Antes, and as a duo with singer and percussionist Aline Morales, apart from participating in Toronto’s Songwriters Expo, a monthly live event showcasing the original compositions of local artists. As a musician/songwriter, she received a composer grant from the Canada Council of Arts in 2007. She was also featured in that year’s edition of Toronto’s Annual BrazilFest, a celebration of Brazilian music and culture, and has performed in each of the first two years of the city’s LuminaTO festival of music and culture. The following year would bring many more high marks, with a string of CBC interviews on both the popular Big City Small World program hosted by Garvia Bailey and CBC Radio 2’s Canada Live series to ring in 2009. That Radio 2 broadcast ( Concerts On Demand ) featured a rare Toronto duet showing by Luanda and mother Irinea Maria Ribeiro, who was in the city through February for a series of small shows. The fruits of that visit will be evident on Luanda’s upcoming debut set Aquarela, which will be released in October. Recorded with some of the top global music players in Toronto, the disc will feature not only Luanda’s own compositions, but a few treats from her songwriting parents.